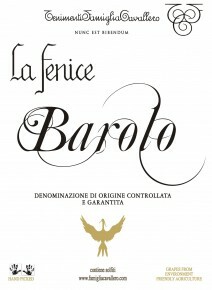 Barolo La Fenice is produced from a special selection of the best clusters of nebbiolo grown in the vineyards in Barolo and Monforte. La Fenice appears a lively garnet with ruby highlights. The bouquet is complex and elegant with early notes of violets, rose petals, and fresh-picked fruits, enhanced by a broad spectrum of spices, with vanilla, cinnamon, and green pepper. The palate is lean and dry, with a firm structure and warm alcohol, yet smooth and well balanced. The finish is marked by subtle tanned leather and black liquorice. La Fenice is the ideal accompaniment to all meat-based dishes, wild game of any type, marinades and stews, dishes with truffles, risottos and aged, rich cheeses. The clusters are hand-picked in late October. The vinification process rigorously follows both Barolo-area traditions and the official Barolo production code. A 20-25-day fermentation at 27°C ensures that the wine will extract generous tannins and extracts necessary for a sturdily-structured wine that must have lengthy cellaring potential. In the spring, the wine is transferred to large oak botti, where it matures for at least two years, or in the case of certain vintages, three years. After bottling, La Fenice rests in glass a further six months before release.